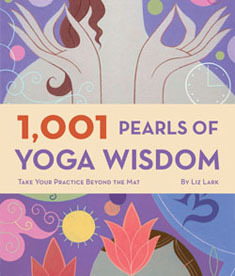 1001 Pearls of Yoga Wisdom: Take Your Practice Beyond the Mat -- This chunky, richly colorful volume takes yoga ''beyond the mat'' to reveal classic yogic wisdom pertaining to the mind, emotions, spirit, and of course, the body. Drawing from such classical texts as the Bhagavad Gita and the Upanishads, as well as modern Indian and Western teachers, this treasure trove of yoga knowledge defines key terms and highlights important themes. It's also a helpful supplement to yoga classes, offering asanas, meditations, breathing exercises, mantras, and mudras for every occasion and skill level. Just the right size to pop into a yoga bag, here's a guide to the practical and philosophical aspects of yoga that complements any spiritual practice. Liz Lark is a noted yoga teacher, author, and retreat leader whose clients include members of the English National Ballet. She lives in London. 1001 Pearls of Yoga Wisdom: Take Your Practice Beyond the Mat -- This chunky, richly colorful volume takes yoga ''beyond the mat'' to reveal classic yogic wisdom pertaining to the mind, emotions, spirit, and of course, the body. Drawing from such classical texts as the Bhagavad Gita and the Upanishads, as well as modern Indian and Western teachers, this treasure trove of yoga knowledge defines key terms and highlights important themes. It's also a helpful supplement to yoga classes, offering asanas, meditations, breathing exercises, mantras, and mudras for every occasion and skill level. Just the right size to pop into a yoga bag, here's a guide to the practical and philosophical aspects of yoga that complements any spiritual practice. Liz Lark is a noted yoga teacher, author, and retreat leader whose clients include members of the English National Ballet. She lives in London.